This lead is designed to connect Le Maitre firing systems to single or double pods. Each end of the lead has a 3 pole Bulgin SA2403 plug which connects directly to the pods and firing system. 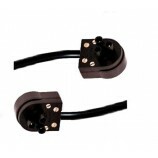 This lead is compatible with twin and single wiring pods, allowing 2 channels to be ignited through one lead.